RGB Light Experience is a bright experience, which involves different professionals, artists and creatives in order to spread light art in all its forms (such as: lighting installations, interactive installations, video installations, vjing to video mapping, etc.) as a new movement in contemporary urban art. AVnode, LPM, Live Cinema Festival and FOTONICA are partner of the event with a conference “AVnode Roma – riflessioni digitali su progetti culturali in divenire” (digital reflections on cultural projects in becoming) on the 24 of October at Casa delle Culture and a Video Mapping interactive game “The Pinball” in piazza dei Condottieri, 33. 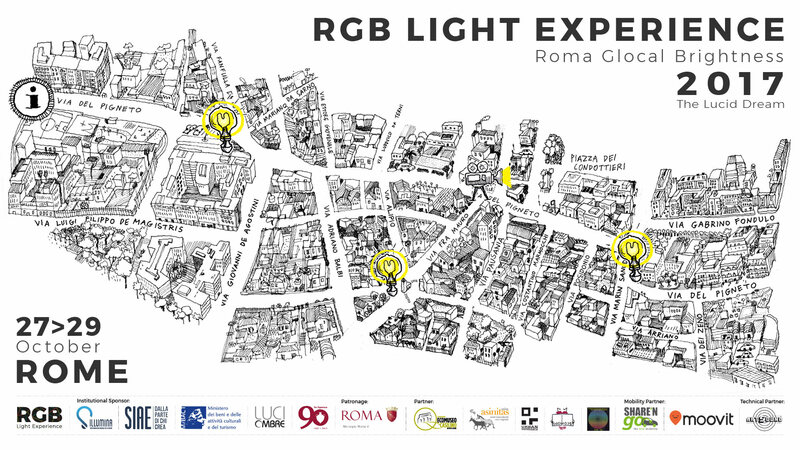 In 2017, the artistic project “RGB Light Experience” explores Roman urban architecture, inviting tourist and citizens to participate in Urban Light Festival free of charge. Site-specific artworks of light art, urban light and video mapping, disseminated along the itinerary, invite visitors to discover the unknown and hidden corners of the city. RGB is an acronym of Rome Glocal Brightness, was born in 2015, curated by ​​Luci Ombre. It’s a Roman society that deals with design, creation and communication of cultural events with a strong fingerprint on the new lighting technologies, paying great attention to sustainability and environmentally friendly projects.